Hybrid is one of those catch-all terms that doesn’t quite describe what a bike can do for you. The bikes we call hybrid/commuters are perfect for transportation when you want to travel a little faster (25km/h+), or a little farther (7-20 km one way trip) than a City Bike might allow you to travel conveniently on a regular basis. These bikes can be a bit more rugged, and are well-suited to day trips out of the city, too! Plus, most come with the usual goodies for everyday riding: fenders, kickstands, rear racks, and built-in lights included! Don’t see the exact model you’re looking for from the brands we offer? We can bring them in by special order, too. Our most fully-featured "do-it-all" bike. Liberty is built on a light and durable aluminum frame, with high quality Shimano XT and Deore drivetrain components, and tons of extras. Each Liberty comes equipped with a rear rack, integrated dynamo lighting system, kickstand, and bell. Each Breezer Liberty is designed to tackle hills, gravel paths, and long distances, on or off-road, providing a confidence inspiring ride that will make you want to spend more time in the saddle ticking off the miles. This bike gives great value for your everyday ride. The Urban X is a fierce all-conditions bike for your everyday commute. It comes equipped with mid-sized 27.5” wheels, chromoly steel frame, battery lights, fenders, kickstand, wide-range gear system, and hydraulic disc brakes. It’s the perfect “no fuss” four-season ride that will keep your wheels turning all year round. The Beltway is a deceptively simple, belt-driven commuter. Gone are the days of chain maintenance and greasy clothing. Thanks to the high-performance and nearly silent belt system, the drivetrain requires minimal maintenance while offering almost twice the durability of traditional chains. With the added protection of fenders, rear rack and dynamo lights, commuting is a breeze on the Beltway! Demo model available. The Doppler Café wasn’t named for our store, but it should have been. Perfect for everyday commuting, or day trips to Port Stanley, you’ll feel comfortable from the minute you start pedaling this incredible machine. Dynamo-powered lighting means you’ll never be caught out in the dark, and the 1x10 Shimano Deore drivetrain will let you power through the nastiest headwind, or surf the “both ways” tailwind you always hope for. The Doppler series is an incredible ride that will let you do more on a bike. Rear rack and pedals sold separately. Ready for anything the city throws at you, the Urban Commuter is fast, slick, and stylish. Freedom to go anywhere, and do anything on two wheels. Disc brakes, fun geometry, this bike rides like magic. 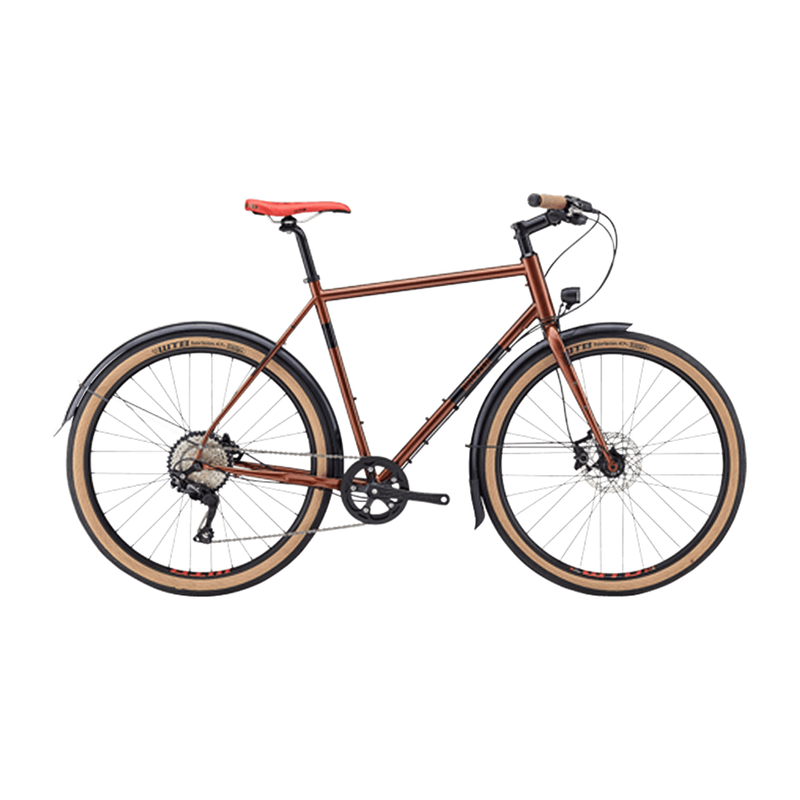 Unlike the other bikes in this category, it does not include lights, fenders, kickstand, or rack, which makes it very lightweight and fun to ride! Fuji’s electric Conductor is your perfect transportation solution! Need an extra boost to go a bit further, or carry a little more? The electric motor will remove those excuses and enable you to ride every day. Too wet? Too cold? Too windy? No problem. The comfortable geometry won't put a strain on you as you ride to work or on your errands, and the electric motor gives you up to 32 km/h of assistance to help you navigate traffic or that steep hill en route. Shimano drivetrains and hydraulic disc brakes provide crisp shifting and stopping power. The Conductor: not just for those evil trains, anymore. Love our Hybrid/Commuter Bikes? Check out our City Bikes, Single Speed Bikes, Cargo Bikes, Gravel/Adventure Bikes, and Kids Bikes!